- Martial Arts Demonstrations driven by story-line and fight choreography. 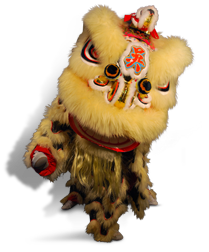 Story of the Lion Dance - There are many variations on how the dance is told, but, the most common is one of a lion searching for crops to eat, often green lettuce is used to represent these crops. The farmer (represented by the contractor) sets out the crops in a spot that will tests the skills of the lion. After it overcomes the challenges of acquiring the lettuce (it is often either strung up high or in a hard to reach place such as a pot) it will then chew the lettuce thereby blessing it's contents. The lion will then spit the blessed lettuce back out spreading luck, fortune and joy to all those around. There are many variations on how the dance is told, but, the most common is one of a lion searching for crops to eat, often green lettuce is used to represent these crops. The farmer (represented by the contractor) sets out the crops in a spot that will tests the skills of the lion. After it overcomes the challenges of acquiring the lettuce it will then chew the lettuce thereby blessing it's contents. The lion will then spit the blessed lettuce back out spreading luck, fortune and joy to all those around.